Commercial / Office / Professional corner site at entrance to new residential subdivision, Retreat at Willow Creek (approx. 250 homes by KB Home and RSI Communities). TABC permit necessary for convenience store operation can be obtained. Shared access easement in place for curb cut to Hunter & CoSM to grant access to Foxtail Run via site plan submittal. Corner lot at signalized intersection of Hunter Road (5 lanes) & Foxtail Run. TxDot 2015 traffic counts - 17,887 Vehicles Per Day. 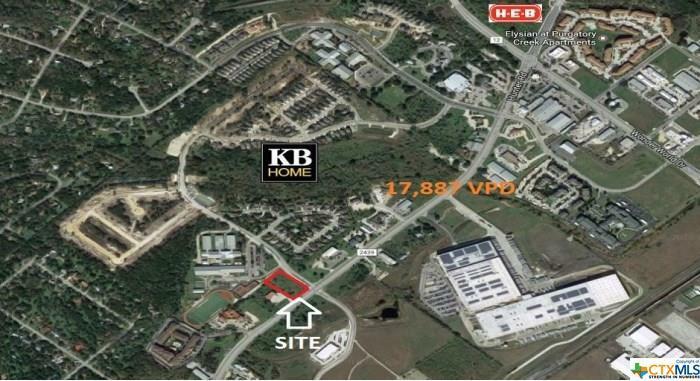 Easy access to IH35 via Wonder World Drive. High growth area of San Marcos.